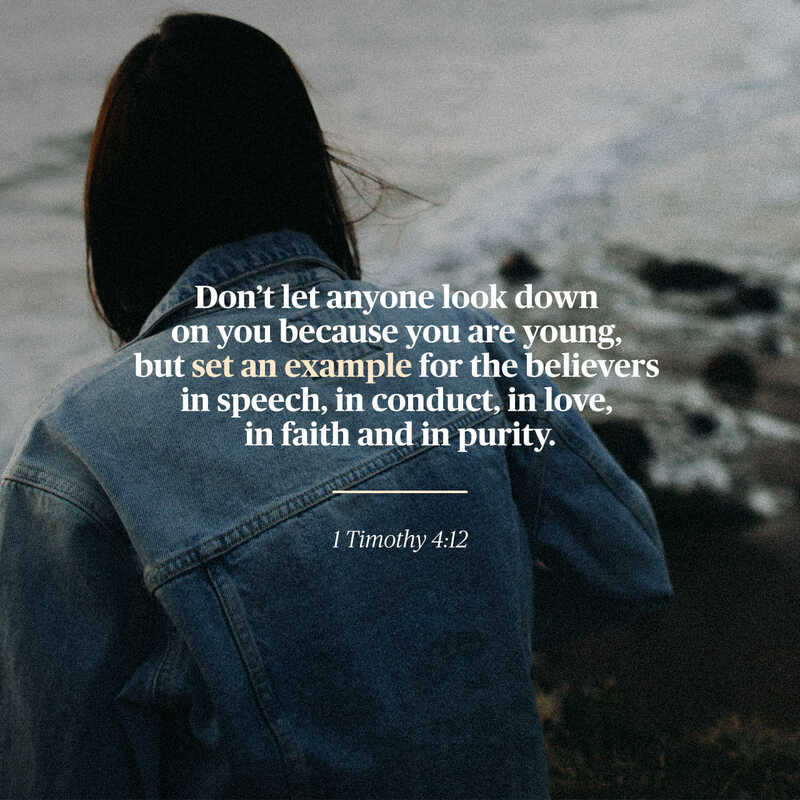 “Don’t let anyone look down on you because you are young, but set an example for the believers in speech, in conduct, in love, in faith and in purity.” 1 Timothy 4:12 (NIV). You are a role model. Whether you think so or not, there are people in your life who are watching you—and looking to your example for guidance on what to do—or, not to do. Whether it is a younger kid in your neighborhood, a younger sibling, or a cousin, you are already a role model in someone’s life, even if you are still relatively young yourself. When I started this blog almost five years ago, I based my title largely after this theme, and the verse listed above. I was sixteen at this point, and have already had a number of role models who have influenced me in my own life—ranging from youth leaders, to celebrities (such as Bethany Hamilton and Francesca Battistelli), to older girls at my church. I also knew that as a Christian teenager, I wanted to set an example in my own life for those who were younger than me. People who were where I have already been, and who were striving to live out their faith to the best of their ability. I wanted to live out the words of this verse in my own life—and set an example for other people my age through speech, conduct, love, faith, and purity. It doesn’t take long to look around at our society and see that as a whole, people don’t really expect much from middle, high school, and college students. I’ve lost count of the number of times I’ve heard people say “Oh but they’re a teenager! Of course they’re going to do XYZ!” Even at twenty, the stigma remains. It is simply assumed that people my age and younger are going to party, drink, and sleep around*. It is something that is simply thought of as something that is normal for people our age. However, we have the chance right now at our current age to be the change that we want to see in our culture. We have the chance to rise up and be role models for the next generation, defying the expectations that come with youth. We have the chance to be a leader in our spheres of influence for Christ. To rise up and defy expectations—running passionately after our Lord and Savior Jesus Christ! Recently, I had the chance to talk to a younger girl at my church who is starting a Christian club at her high school. I know another girl who, at only fourteen has started making Christian vlogs and posting them to YouTube. These people are living examples that you are never too young to make a difference and lead people closer to Christ. You have the chance now—right where you are! I want to challenge you to go into your week with this takeaway: you have a chance to be a role model in your generation. You have the opportunity influence those around you in a positive way—it is up to you how you use it. Today, in this day, you have the chance to be a positive influence in the lives of the people around you. To lead people closer to Christ. To encourage kindness in those around you. To love people like Jesus. To live a life characterized by faith and purity. You have the chance to set an example. How will you use it? “Therefore, since we are surrounded by such a great cloud of witnesses, let us throw off everything that hinders and the sin that so easily entangles. And let us run with perseverance the race marked out for us, fixing our eyes on Jesus, the pioneer and perfecter of faith. For the joy set before him he endured the cross, scorning its shame, and sat down at the right hand of the throne of God.” – Hebrews 12:1-2 (NIV). “The soothing tongue is a tree of life, but a perverse tongue crushes the spirit.” – Proverbs 15:4. I still remember the first time I ever heard those words. I was in a Christian girl scouts group in the 6th grade. I was a gawky and awkward preteen. I was also painfully shy. I remember being partly in shock; why was it that this girl was refusing to let me sit with her, when as far as I could tell, she wasn’t saving that seat for anyone? I had never done anything to make her not like me—I didn’t even know her! I also remember feeling hurt, unsure what I could have done to make her respond the way that she did. Over the years, I’ve dealt with more incidents like this. Incidents where I was forced to sit by myself in a classroom. Incidents where the ‘cool girls‘ refused to talk to me. Incidents where cliques and girl-politics abounded. I also witnessed friends deal with this. And sometimes, it was what wasn’t said that spoke the loudest. Like many teenagers in high school, I’ve dealt with my share of being-bullied and being on the outside. I’ve dealt with my share of loneliness. I’ve dealt with the creeping feeling that I don’t belong. I am grateful to say it was never as terrible as what some have experienced—with constant torment or physical abuse. But words can still hurt—and our words and actions can carry a lasting impact on the lives of those around us. However, because of my own personal experiences with words, I have become more aware of their affect on the lives of those around us. I have become more aware of those on the fringes, and have made a promise to myself that whenever possible, I would use my words to uplift, encourage, and include. That I would never use them to make a person feel less-then or to tear someone down Today, I am determined to never make another person feel the way that I felt back in jr. high school. Because if there’s one thing that I’ve also learned over the years, it’s that words of affirmation can make an impact too. An encouraging word, a prayer over a friend, and a decision to befriend someone who’s new all have the potential to turn someone’s whole year around. And every day, we have the opportunity be this person to someone—whether it be at school, work, church, or the local grocery store down the street. We have the opportunity to be the hands and feet of Jesus, and show others the amazing love that He’s shown each one of us—shining a light for His Kingdom and reaching out to those who are hurting and broken. No matter who you are or what your life looks like, you have people in your sphere of influence who are watching you. Who know that you’re a Christian and are looking to you to see what it means to be a follower of Christ. Whether your the head cheerleader at your high school, or the shy girl hiding behind the safety of a textbook, your life and your words matter. And you have the chance to impact those around you with your words. We hold within us the power to touch lives in our conversations and the choices that we make every day. Proverbs 18:21 says, “The tongue can bring death or life; those who love to talk will reap the consequences.” (NLT). As we go into this new and upcoming school year (whether you’re still in school or not), let us make a conscious effort to let our words be a light, and a city on a hill that cannot be shaken (Matthew 5:14). Let us reach out to those who are hurting, and stand up for those who are being bullied. Let us love with our words and with our life. Let us never miss out on a chance to speak life and shine our light for Christ.